This roster is somewhat of an evolution. Any known, documented cars are listed. There could be others and if anyone has information or photos please submit them. Click on most thumbnails to view images. 1/359 boxcar To Travel Town as complete car 1960, incorrectly numbered 18. Moved indoors in 2001. 3/389 boxcar In the Alabamas, outside Lone Pine. 5/403 boxcar To Laws RR museum 1960, complete except for trucks. 6/407 boxcar Ex. SPC #222, built 1885, body to Diaz lake 1960, to CCRW in 2002 Car restored with trucks and on display at Eastern California Museum, Independence. Scheduled to go to Dehy Park in 2018. 9/430 perlite On Zucco St.in Lone Pine. 11/449 boxcar Retired by 1950’s, to Kern County museum as #1. To OERM in 1990’s, complete car. 13/451 boxcar Body to Charles Mates of Lone Pine in 1960, moved by CCRW in 2004 to Betty Dews residence south of Olancha. Given to CCRW in 2015. Repainted and repaired and traded to Laws RR museum in 2018, now at LRRM. 14/457 boxcar Body to Russell Fleming family at Fort Independence 1960, still at Fort Ind. 15/336 boxcar Originally Lake Tahoe Railway #5, to SP 1927, to Laws complete without trucks 1960. Traded to CCRW in 2018, now in Independence under restoration to operation. 16/337 boxcar Originally LTR&T #6, to SP 1927, body to Ben Randolph of Lone Pine 1960, at home in town with #58. 17/338 boxcar Originally LTR&T #7, to SP 1927, to Laws as complete car 1960. Returned to service and used in 2017 with engine #18. 20/315 boxcar Car sold to W. Harrah 1960, to Silverwood theme park 1986. 23/380 boxcar To Laws 1960, complete except for trucks. 25/396 (probably) boxcar Body in Alabama’s, has large end door. 26 boxcar Former Florence and Cripple Creek car, also ex-NCO car. To Universal Studios in 1950’s, finally to Nevada County Narrow Gauge Museum in Nevada City, CA. Was lettered for NCNG. 42/306 boxcar Body to Ben Baker of Lone Pine in1960, currently outside of Bishop, on Dixon Lane. 45/313 boxcar To Laws 1960, complete except for trucks. 47/346 boxcar To Laws 1960, complete except for trucks. 49/356 boxcar Body to Maggie Wilson of Lone Pine 1960, in Lone Pine near #83. 50/360 boxcar Body to Ed Butterworth of Olancha 1960, in Olancha off hwy 395, has had one side removed. Not much remaining. 51/365 boxcar Body at ranch of Sandy Kemp in Alabama’s with one other car. 53/370 boxcar One of Ben Randolf’s cars, possibly could be #93. 54/371 boxcar Originally SPC #96(? ), to N&C 1905, body to White Cap Mine 1960, body located in Big Pine at Jeff Jewett residence until 1997. Donated to CCRW and traded to Babcock family for D&RGW stock car 5771. Body moved 10-1997 to Fallbrook, CA, restored in 1999 to operational condition with couplers & brake gear from SP #467. 57/384 boxcar To Laws 1960, complete except for trucks. 59/394 boxcar Body at Danny Miller residence at Fort Independence. 65/427 boxcar Body to Ed Kivett of Dolomite in 1960, currently owned by Manuel Castro, located on Dolomite spur r.o.w. 67/431 boxcar To Laws 1960, complete except for trucks, placed on Death Valley RR trucks. 68/462 boxcar Body to Harold Yeates of Lone Pine in 1960, body on top of rocks in Alabama’s, car was demolished 2-2006 by new owners, hardware and some wood to CCRW. 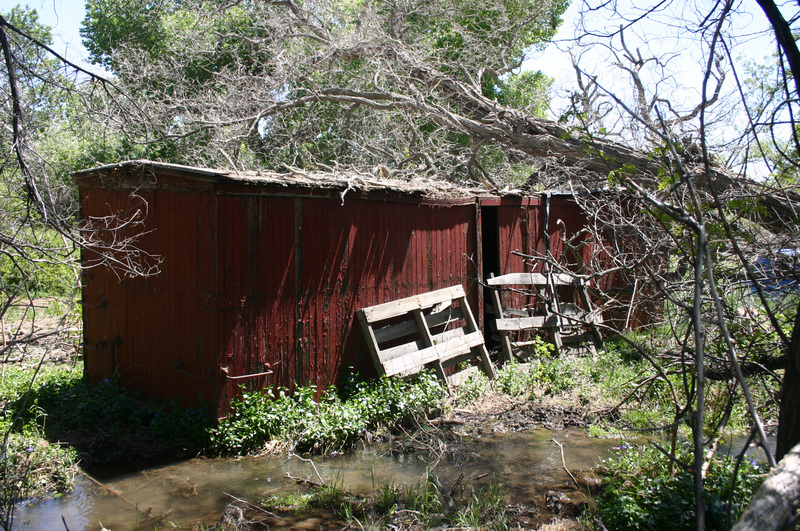 70/437 boxcar Body to Andy Garcia of Lone Pine in 1960, moved north of town of Pangborn ln. next car #90 and #71. 71/438 boxcar Body to Ben Baker of Lone Pine in 1960, located next to cars #90 and #70. 72/439 perltie Body to Bill Poole of Independence in 1960, likely car owned by Rich White. Converted to Perlite car in 1950’s. 73/440 perlite Body to Les Stewart of Laws in 1960, on property owned by LADWP near Laws. Moved to Eastern Sierra Museum in 2009. Still retains many of its perlite car doors. 76/460 perlite Body to John Walker in 1960, body built into garage in Benton. 77/463 boxcar To Laws 1960, complete except for trucks. 78/464 boxcar Body to Matt Perez of Lone Pine in 1960, car is at home of his daughter in town, has been covered and turned into guest room. 79/322 boxcar Body to Dr. Smart (veterinarian) of Lone Pine in 1960, at home off Pangborn ln. 81/379 boxcar Body to Bobbie Miller of Lone Pine in 1960, on farm of Jean Crispin in south Lone Pine. 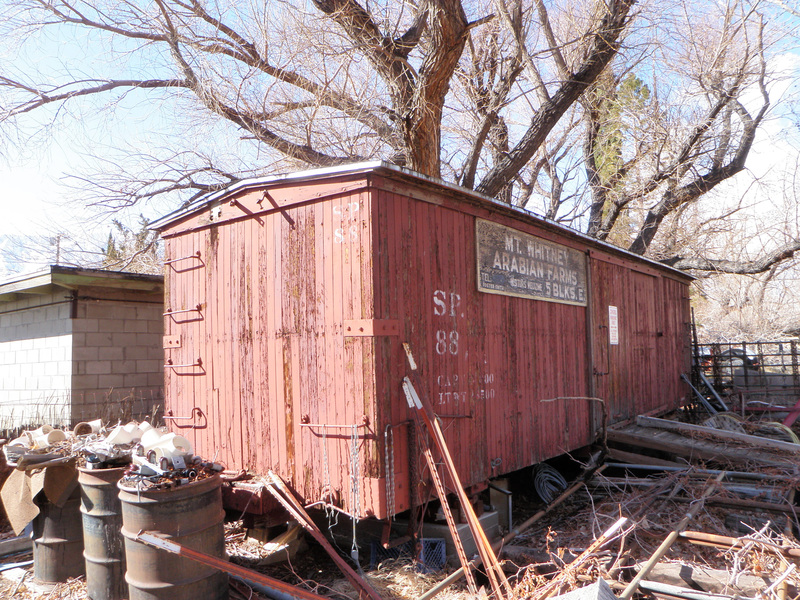 83/397 boxcar Body to Henry Olivas of Lone Pine in 1960, at home on west side of town. 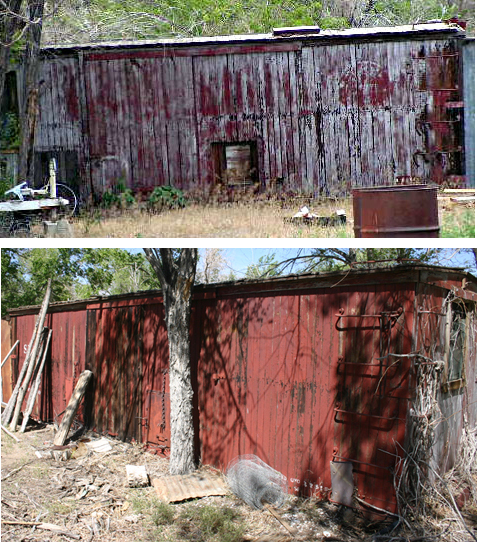 84/402 boxcar Body in Bishop until 2011 when donated to Historical Society of Dayton Valley. Now at former C&C Dayton depot for restoration. 86/408 boxcar On ranch north of Fish Springs Rd, south of Big Pine. No longer on ranch in 2017. 88/412 boxcar Body to Clarence Dixon of Lone Pine in 1960, at home in Alabama’s. 89/442 boxcar Body at home in south Lone Pine. 130/335 boxcar Originally LTR&T #4, body was at Sandy Kemp ranch in Alabama’s with #51 and one other car, acquired and loaded by CCRW. Currently on trucks at Nevada County Railroad museum and under restoration after trade with CCRW. 132/411 boxcar To Laws as complete car in 1960. 137/372 boxcar In Lone Pine. 139/419 boxcar Body to Ed Kivett of Dolomite in 1960, owned by Paul Lamos at Lake Minerals north of Olancha. Roof blew off in 2011. Car scrapped in 2015 with hardware going to CCRW. 303 boxcar Carson and Colorado Le Mothe patent pipe boxcar. Used in freight and Wells Fargo service until 1906 when retired at Mina, to NSRRM in 1983. No trucks, doors, or brake hardware. 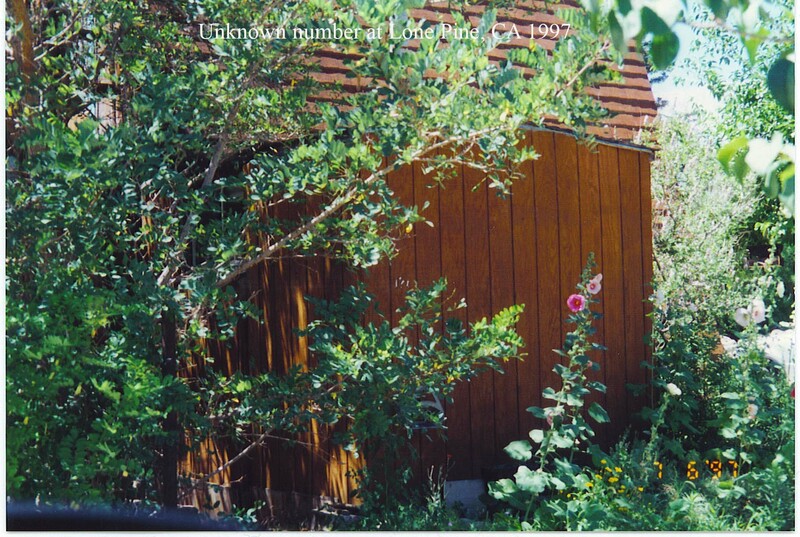 317 boxcar Acquired in 1999 from Mineral County Museum, Hawthorne, NV. and now at NSRRM. Also a La Mothe patent pipe boxcar. No trucks, doors, or brake hardware. 426 boxcar Originally Oregonian RR #170, to SPC as 444, then to N&C as 426. Retired in 1920’s as shed, to NSRRM in 1980’s, to SPCRR in 1992. 474 boxcar This car was SPC #474. At some point became station at Montgomery Pass, remains at that location although badly deteriorated.
? ?A boxcar Body to Paul Hunter of Independence in 1960, likely the car currently owned by Mary Mairs of Independence. Likely is #63.
? ?B boxcar Likely is #66.
? ?D boxcar Body at home of Dale Davidson in Lone Pine, covered over as guest room.
? ?E boxcar Body was at Lone Pine Rodeo grounds, now somewhere in the Dayton, NV area. Number still unknown. boxcar Former standard gauge boxcar, was maintenance shed in Keeler for many years. * Cars are listed by their post 1946-47 number first and prewar number second. In all but one case these numbers have checked out in field when able to cross reference them. ** Most of the cars listed above are Carter Brothers built for either the Oregonian Railroad or the SPC. Most cars were transferred to N&C in 1904-05 to handle traffic needs of Tonopah gold rush but not officially transferred on paper until 1906-07. 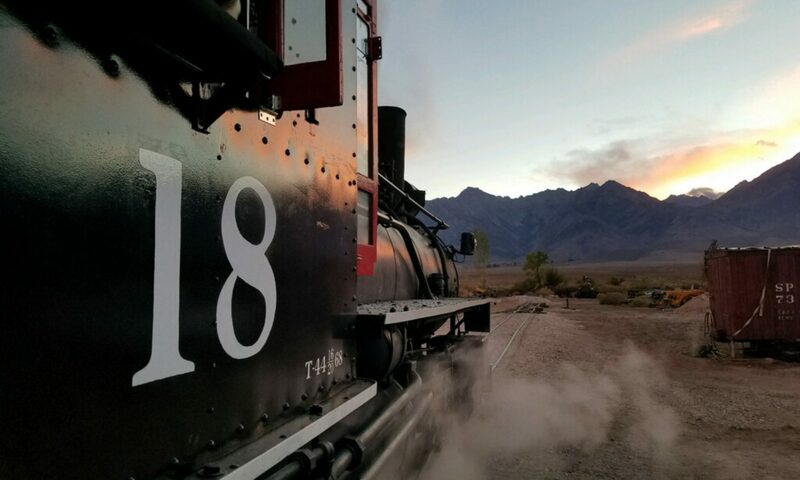 ***Many thanks to Wendell Huffman of the Nevada State Railroad Museum for all the photos and information he’s sent me.